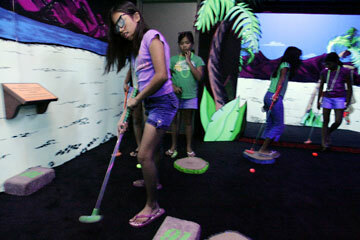 Glenn Villarmia and his daughter Lindsay of Makakilo test out their putting skills at Big Kahuna's 3-D glow-in-the dark golf course. 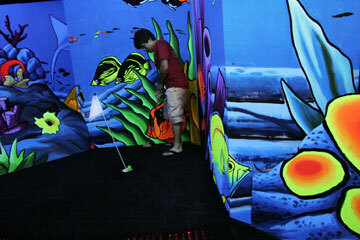 Exotic flowers, skull posts, eerie tiki eyes and sea creatures are among the eye-popping effects at Big Kahuna's, a 3-D glow-in-the-dark mini-golf course that journeys through a jungle, ocean waves, underwater coral reefs and active volcanoes. Place: Waikiki Shopping Plaza, 2250 Kalakaua Ave.
Time: 10 a.m. to 10 p.m. daily. The background drum beat had Jordan Bayang dancing about like a restless native. Golf club in hand, adorned with the 3-D goggles, his fancy footwork showed that he was enjoying the adventure. "The funniest part was when my brother hit the ball at the 17th hole and he missed and it ended up in the 18th hole, with a hole in one," said Bayang, 13. The music and 3-D effects intrigued him, but space was an issue. "In the ocean area, it is like a giant sandwich. The courses are too close together." On the positive side -- it was inside, cool and air conditioned, he added. The Hawaiian theme builds upon the adventures of "Big Kahuna," a cartoon-like character (also the Plaza's mascot) who is painted on the wall. 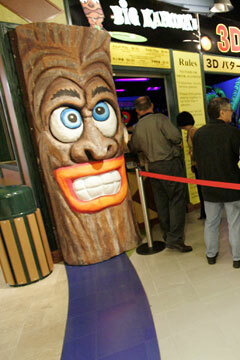 In the beginning of the course, the kahuna takes golfers into a jungle filled with tropical birds and flowers. As he moves ahead, the drums get louder -- a sign of headhunters. Big Kahuna jumps aboard a canoe, his vessel is capsized and he sinks into the deep blue sea. Dolphins come to the rescue, bring him safely back to land, only to face an active volcano. 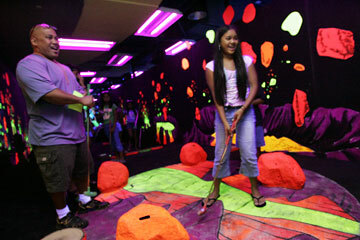 Kaleb Abelon sinks his putt surrounded by day-glo. Cissy Driver of Waimanalo brought her four grandchildren, Kanani, Taylor, Bobbie and Austen, to the course. "It was lots of fun for the children," she said. "The glasses really bring things out." She was especially pleased with the reasonable admission. "Everyone got a free pair of glow-in-the-dark beads. And you could feel the earth moving on the last round." For 7-year-old Bobbi, the lightning at the end of the course was the best part. "My toenails were glowing," she added. The kids also commented on the sounds of the ocean waves, and the 3-D effect. "The waves actually move when you are walking," said Taylor, 9. Four-year-old Austen even tried to sneak back in for another go. It wasn't fun and games for everyone, though. Tony Godoy, a visitor from California, said he wasn't all that impressed with the course. "The holes were kind of boring. It was the same thing over and over," he said. "I also got a headache after awhile from wearing the glasses." He did allow that the scenery was nice, though. "I liked the paintings on the wall." A round of play comes with another bonus: "The five hours of free parking is what people like the most," said employee Matthew Lakin. "The course takes about a half hour or 45 minutes. After that, they can go eat downstairs or walk around Waikiki." Ikaika Marabelles, left, finishes the course with her 3-D glasses on. A tiki welcomes visitors to the golfing area at right.